The home was beautiful. Love that the neighbors are far away. All cabins I've been to, have to no Bonfire and are we are so please that this one did. Loved everything about this cabin. It's number one on our cabin list. The only thing that may need a little tweek is the checkout time is too early. We like to sleep in on our vacation and 10am is a bit early to get up, have breakfast, clean, and load our belongings. 12-1pm would be a better checkout time. Oh and some wifi would be great also. We rented the entire home for a long weekend. The home was beautiful and well decorated. It has everything you need for a great vacation. The views were amazing from every window, and dog friendly. the resort has lots of fun activities and great food. There are several hiking trails in the local vicinity. The view is awesome, very nice and relaxing. All areas were very clean and tidy. I feel like the whole complex is aging a lot but our stay was very nice. I'm not sure if all the units have the bedrooms upstairs but I can see that being an issue in the future as we age. Overall a good stay. The location was perfect, the cabin was clean and cozy. We had a great family weekend there! The home was pretty wonderful! The only thing that I'd say bothered me was the upstairs shower leaks pretty bad after using it. Comfortable townhouse in a great location with lovely views. Unfortunately the weather did not cooperate so we could take advantage of the patio and balcony. We did enjoy being able to walk to so many places, though. the home was great. open, spacious, inviting, well organized. i stayed there alone so i'm sure with a larger group it may get a bit cramped, but it was perfect for me and a small (1-4) would be perfect. the only complaint was that when the neighboring homes were occupied, the walls are very thin, and i could hear people talking, etc. through the walls. a bit uncomfortable. Perhaps add some insulation between the homes. Ultimate relaxation! The deck, the wood stove, jacuzzi, the sauna, were perfect for stress free respite. Nordcapp is wonderful for a solo retreat, the view of the lake exquisite. Nordcapp is the "North Cape" in Norwegian, an area on its furthest north coast. Fishing grounds for my grandfather and his father in Norway, so the name is special to me. Cabin was clean, and had everything I needed, even lots of firewood. Cappuccino machine for extra luxury! Right off the bike trail, nice for walking if you don't bike. On a high cliff, so perhaps not for small toddlers, older kids would know to be careful. My whole family absolutely loved the cabin we stayed in! We were right by the lake and could listen to the waves during the night, a MUST for me when I go up north. The gas fireplaces was also amazing and I loved sitting nearby and reading a book. Loved LOVED the home--perfect location on Lake Superior. Amenities were abundant-great restaurants, hiking/biking trails, pool, Grand Marais so very near! The cabin is beyond adorable and well appointed throughout. The spot on the shore is spectacular with an unrivaled view of the lake and the morning sunrise. Loved the stone fireplace! This has been my favorite cabin to rent out of all of the ones I have rented from Cascade. Definitely a 10! The Condo was exactly as presented! The bedrooms were comfortable and welcoming, the view from the deck was amazing! We especially loved the deck furniture, which invited us to sit in the unusually warm November sun (we didn't even need sweaters!) and read. It was wonderfully quiet, and felt very peaceful, despite being in a development. The beach is AMAZING! We usually stay in stand Single Family residence, but this location is one we would visit again. It is centrally located, a quick drive to Grand Marais, and has enough restaurants nearby to be just right. The only suggestion we have is a reading lamp in the sitting room when you enter- it begs for you to sit and read a book, but it could use a floor lamp behind the couch. Other than that, it was wonderful!! Hovland Hideaway has incredibly comfortable new furniture and nice warm comforters for chilly evenings. We love the propane stove for heating the cabin up quickly! The cabin is the best maintained and cleaned of all the Cascade Vacation Rentals we have rented. We will return to this cabin in the future. The place was amazing. We arrived in the dark but the porch light was on. The first thing you heard was the waves crashing up on the shore even though it was pitch black. The house is wonderful and exactly how it is described online. The upstairs is even bigger than what the picture makes it look like. I was going to have to sleep on the pullout in the loft area but another couple cancelled, however, it would have been plenty of room for me and not feel cramped at all. Lots of hot water, liked that you could adjust thermostat per room even though it was not needed. Kitchen was welled supplied and all the appliances that we used were great. Location is great. Right off of Hwy 61 right before you hit the Holiday Station, AmericInn and Blue Fin Bay in Tofte. But you don't hear any traffic noise because of the Big Lake. 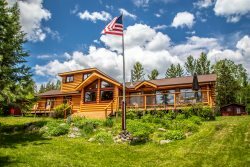 Love the location because it is easy to access the hwy and is so close to so many great hiking trails and lakes. IMO the absolute best thing about this place is the Big Lake. Love Lake Superior and how it is constantly changing and different. It is secluded enough with other houses on each side but not super near by. The "beach" that is super easy to access is all large rocks. We had a fire out there, cooked hot dogs and steaks and potatoes. Search for drift wood and cool rocks, built rock Cairns, could have stayed out there all day. Enjoyed the DirectTv because of the World Series. We loved the cabin. We loved the location. The video (I think posted after we booked) is helpful because I had been concerned about how close the cabin was to the highway. It's great that it's so far from 61 so there's not much traffic noise. The woman I spoke with on the phone before we came up was very helpful. The provisions in the cabin were perfect. (I'm very glad there is no wi-fi - we all need to get away from our computers/internet. )The dvd/vcr set up was nice to have when it rained. The location of Base Camp was great for us. Our family spent the MEA weekend hiking and it was convenient to state parks. The cabin was lovely. It was furnished well and had everything we needed for the weekend. It was clean and well kept. House has good bones. Nice workmanship on the bathroom updates. Very nice sized deck and the views were remarkable. We liked the Tempurpedic beds but think it's time for updated living room furniture. Difficult to get out of. We visit every year for knitting retreat. Love the fully stocked kitchen. The view is fantastic. New furniture is a plus in great room. Could use one more easy chair, as we like to spread out to knit. It is just a beautiful house. Staff is very helpful. Always a supply of wood for fireplace. Feels like home. Loved it! We will be renting this condo again!! Nicely decorated. One suggestion... Different twin beds. Uncomfortable and loud. The cabin was in a perfect location on the lake. The best part was that we could bring the dogs. We planned this trip with them in mind. We had three generations and two small dogs in our group. We were very pleased with the accommodations. We liked the open floor plan. There was plenty of room for us to all spread out. The house is nestled in the woods and is quite private, but conveniently located to the local attractions. Caribou Lake is really beautiful! We all agreed that we would love to stay at Maple Haven again.